The flowers in The Gruffalo – there aren’t any in The Gruffalo’s Child, as it’s winter – seem to be mainly foxgloves and primroses. Which is tricky, because they’re definitely not out at the same time. 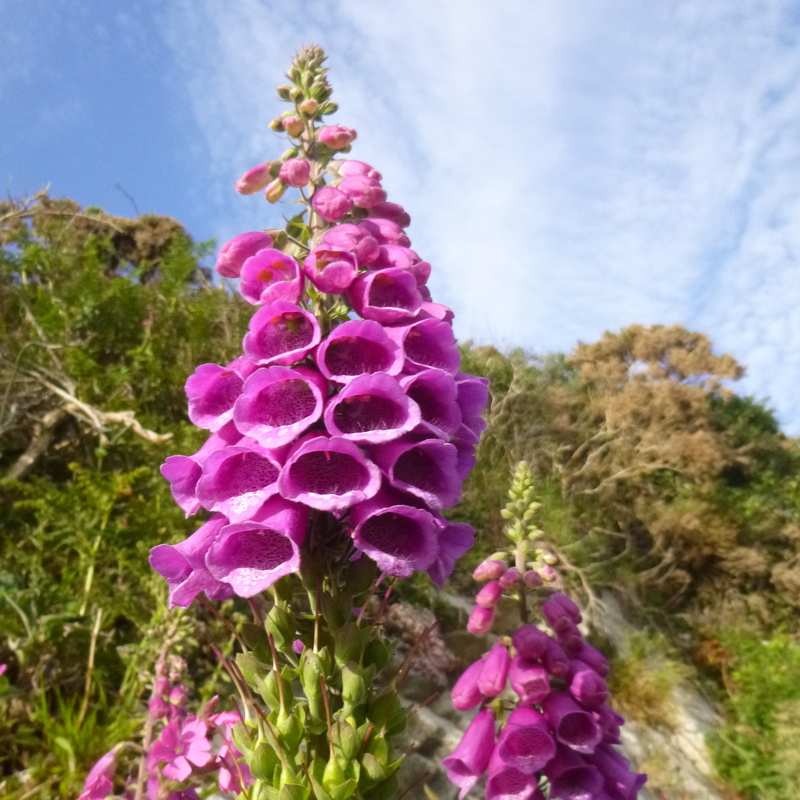 We get primroses in our garden, nestled in the long grass by the trampoline, but foxgloves were an excuse to head to coastal Pembrokeshire, where tall spikes of hot pink bells soar skyward from every hedgerow in late spring. Closer to home, however, it seemed a bit rude to ignore one of the loveliest wildflowers found near us: orchids. But tempting two little boys for a walk onto Selsley Common to search for flowers wasn’t instantly going to be viewed as their best day out ever. So our orchid odyssey was disguised as a chocolate button hunt. “I’ve never seen chocolate buttons on Selsley Common before,” was Sam’s doubtful rejoinder when he heard about our proposed expedition, but aged five, we can still, just about, convince him that Cadbury’s latest marketing ploy is to hide packets of chocolate in clumps of grass on a Gloucestershire hillside. We were almost accompanied on our wander by a group of the cows that roam the Common, which followed us insistently for a few minutes to Sam’s increasing distress. “They’re big, and their horns are big too,” he whimpered, upset. Luckily, we knew from previous years where to find orchids close to where you park the car, so only a very little deception was required before we happened across some early purples. But you have to get your eye in – they’re close to the ground, and not shouty flowers, but delicate little pyramidal shapes that you glimpse as a small splash of vibrant pinky-purple against the green grass when the sun hits them. Once you’ve seen one, you suddenly see loads. Mungo heads away from early purple orchids towards something else purple – and chocolatey. They’re delicate, lovely things that look just perfect in the place where they grow, on a breezy hillside in springtime. Which makes it really quite painful when a small child tramples a few in their eagerness to reach the purple flash of a packet of chocolate buttons, also glowing, rather less subtly, in the sunshine. The boys enjoyed it, though whether it was more the search for wildflowers or the chocolate buttons, I’m not sure. At least it got them outdoors on a lovely Sunday morning. Selsey Common is easy to find – up the hill on the A4066 heading south out of Stroud. There’s plenty of parking. 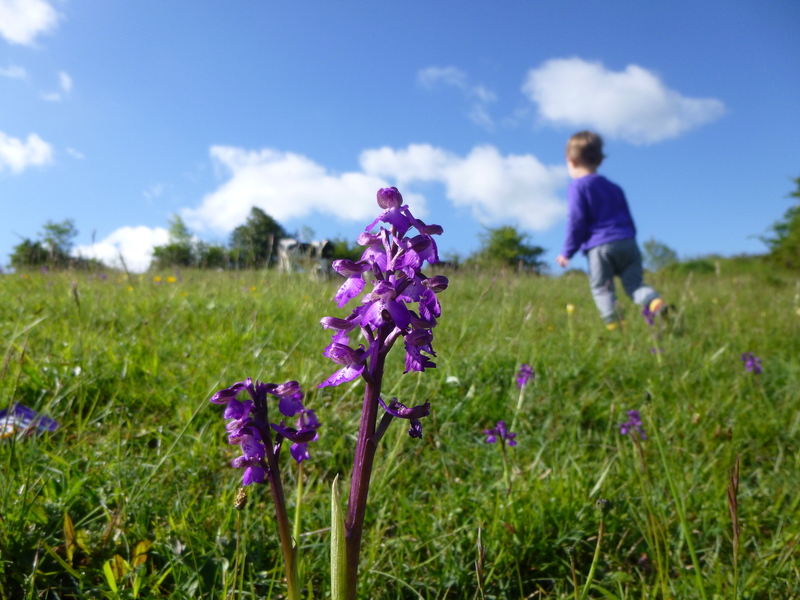 It’s a great place to visit at any time of year – early purple orchids appear as early as mid-April until June. Pyramidal orchids can also be found on the Common, and they flower in June and July. From early March, a walk on the Common should also flush out a few skylarks. Listen out for their frantic, vibrant call, normally delivered in an indignant manner about 40 feet above your head. Look out, too, for buzzards and kestrels.